A video of Russians drunkenly singing as a bear approaches has gone viral. Tourists camping out in a forest in Russia's northern Murmansk Region were unruffled when a curious bear approached their fireside picnic. Turning to the large brown bear with mobile phone videos capturing the predator's approach, the drunken party sing a lusty Russian ballad, accompanied by guitar. As the wild animal came closer the lyrics of a popular old Soviet song about hares that are not scared of wolves ring out - with one nonchalant singer heard to sing 'bear' instead of 'hare'. 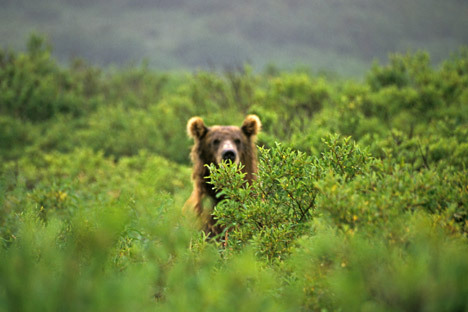 The curious bear can be see pausing before lumbering off in the opposite direction. Whether the party realized how close a shave they had or - indeed - how humane their response was, is not known: According to ecologists, since the beginning of the year 14 bears have been killed in Murmansk region because of danger they posed to people.